An advanced driver assistance system might not throw a diagnostic trouble code when it needs to be calibrated, an I-CAR panelist in a spring SCRS video noted. This reality demands a collision repairer conduct the proper research and think critically about what elements might require the procedure — and do so at the repair planning stage. 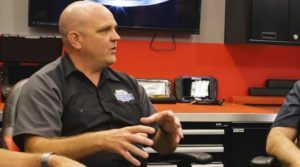 “A lot of these calibrations might not even set a code,” I-CAR industry technical relations director Jason Bartanen said in the video, one of several in an ongoing series from the Society of Collision Repair Specialists. Bartanen was joined by fellow panelists Toby Chess (Kent Automotive), Barry Dorn (Dorn’s Body and Paint) and Bruce Halcro (Capital Collision Center). Bartanen noted that calibration, which involves adjusting a vehicle system to the point it sees and reacts to the world properly, can be confused with scanning, which simply directs a technician to areas of the car needing attention through diagnostic trouble codes. He likened calibration to dialing in a new rifle scope to ensure a shot goes where the sight is aimed. A system might require recalibration after damage — or even just simply being disconnected, but you might not know it even with a scan, Bartanen said. A technician might get a diagnostic code once a system is disconnected — but not one indicating it needs to be calibrated once reconnected and cleared. Conversely, some systems when disconnected and reconnected don’t require calibration, according to Bartanen. “You don’t know unless you’re doing that research,” he said. In addition, a shop must think critically about where the damage occurred and what systems could be affected so that it knows what procedures to research, according to Bartanen. A shop would want to know these answers up front, to account for these procedures on the estimate and know if such work requires subletting to a third party like a dealership, he said. Obtaining these answers can require getting familiar with other areas of OEM repair manuals besides body repair-related instructions, he said.